But no, it all seems serious. That said, the ČTK piece lags far behind a related one from the premier Czech newspaper Lidové noviny which provides many more vital details. This all has to do with a 2009 contract to the Czech Army from the domestic firm Zeveta Bojkovice, a.s.*to deliver 3,000 “grenades,” actually meaning the explosive part delivered by an RPG personal anti-tank weapon. Several of these were found to be defective, and Zeveta has not been cooperative in its reaction. The Ministry of Defense started complaining back in 2011, but the firm has kept denying any defects and refusing any financial restitution, so that the affair has finally landed up in court. That Kč 39 million that the government is trying to win back amounts to around €1.4 million. By itself, this sort of incident is not so surprising. Czech public procurement generally has gained an unsavoury reputation for mainly seeming to function to enrich insider businessmen, who deliver shoddy performance at high prices. The really interesting aspect here is that the Czechs discovered that this ammunition was faulty in Afghanistan, where back in 2010 they had a 700-man contingent under NATO. That original ČTK piece just said “grenade,” which got me rather indignant; a hand grenade is a close-combat weapon whose failure to explode when expected easily results in serious consequences. But then I found out from Lidové noviny that this rather had to do with the RPGs. That’s a bit better, mainly because these are weapons that are meant to be fired at some range. Furthermore, given that the Taliban generally have no armored vehicles – i.e. the type of target one would expect to have to fire an RPG against in an emergency – these were likely generally fired under rather less urgent circumstances, probably against structures like buildings. One hopes that the defects discovered did not include any tendency for these munitions to actually explode when they were not supposed to. Still, even if we assume that – and even keeping in mind the rock-bottom Czech standard for government procurement – this sort of failure is deplorable. * If you still are looking for a laughing matter, that link I provided previously was to the English version of the Zeveta Bojkovice website. This is the holding company that owns the ammunition firm, but anyway – what’s this appearing high-up on their homepage? For real! This is also no April Fool’s prank, I promise! Strange news from out of the Czech Republic, where it seems around 5.5 million liters (= 3,594 barrels) of oil from the state strategic reserve has just disappeared, according to Dagmar Klimovičová at Hospodářské noviny. It appears the Czech government subcontracted the task of managing its strategic reserve to Viktoriagruppe AG, a German company headquartered in Munich. That was its first mistake; allowing Viktoriagruppe to take part of that reserve outside of the Czech Republic was its second. The Viktoriagruppe company . . . has not been able to explain reasonably since 23 September where 5.5 million liters of this material has gone to from its German storage facilities at Krailling [just outside of Munich]. Rather, it has been firing employees as it faces legal proceedings from Czech and German customs and financial authorities. Viktoriagruppe also runs oil storage facilities for the Czech strategic reserve – for now – at three separate sites within the Czech Republic. Not surprisingly, that state petroleum reserve company (known as ČEPRO) is now busy having the oil Viktoriagruppe stores there – 15 million liters of it, or 94,347 barrels – transferred to other facilities under ČEPRO’s direct control; that, together with doing the same with the remaining oil stored in Germany, is now “our primary interest” according to under-fire ČEPRO head Pavel Švager. 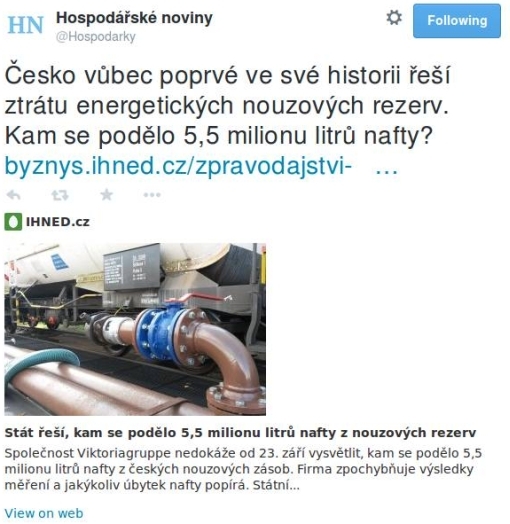 That oil still in Germany, according to this piece, is “many times more” than the 15 million liters ČEPRO is seizing back from Viktoriagruppe’s Czech facilities; journalist Klimovičová understandably won’t give the precise figure since, even though no doubt such a figure exists somewhere in the books, the real one won’t be known until the comprehensive audit of just how much Viktoriagruppe is holding there in Krailling for the Czech Republic is complete. This isn’t the first such run-in ČEPRO has had with Viktoriagruppe, writes Klimovičová: just last summer there was another discrepancy, of around 700 million liters, discovered during another audit of the latter’s German holdings of the Czech reserve. Viktoriagruppe officials tried to blame the shortfall on losses due to the transport and storage processes, but ended up paying a CZK 500,000 (€17,960) fine anyway. The larger issue though, of course, is that of storing one’s national “family jewels” on foreign soil, and therefore outside of direct national control. Perhaps it’s something to be avoided, whenever possible, as the Czechs are finally finding out now. At least we are not talking here about the analogous case of the national gold supply: it is true that many countries have theirs stored outside their borders, for various historical reasons, at places like New York (mainly at the New York Fed) and London. I don’t know whether that applies to the Czech national gold supply; who knows what happened to it between Nazi and Soviet occupations of the country last century, and in any case what was left of it presumably was split with Slovakia during the “Velvet Divorce” at the beginning of 1993. The good news here – while also bad news – is that that petroleum reserve is now steadily dropping in value anyway, what with the recent fall in oil prices worldwide. Bohuslav Sobotka: this 42-year-old fellow (to the left) is going to be the new Czech Prime Minister as of this upcoming Wednesday, and you can read a fairly good introduction to the man in the GlobalPost (via Agence France-Presse). Yes, in the Czech Republic top politicians are often quite young – public personalities above a certain age are often discredited by what they did during the bad old days – and it’s good to get the political scene there somewhat back to normal, after a 2013 that saw a caretaker PM in place whom nobody wanted, after the previous head of government had to resign in a corruption scandal. Specifically, these things sound rather odd to anyone who has followed The Fleet Sheet’s Final Word (a free, English- or Czech-language, Monday-through-Thursday daily comment on Czech politics) for any length of time. 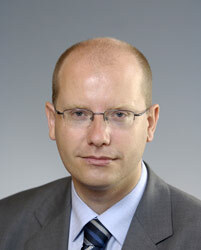 There, Bohuslav Sobotka has long been known as “Suitcase Sobotka,” an indication of his preferred method of accepting illegal money – in the past, at least, such as when he served as the Czech Republic’s Finance Minister from 2002 to 2006 under three successive Social Democratic prime ministers. By our count, three Czech PMs have left office as a direct result of some sort of financial scandal (Václav Klaus, Stanislav Gross [under whom Sobotka was Finance Minister], Peter Nečas [the last properly-elected PM before Sobotka]). What sets new PM Bohuslav Sobotka apart from these three, as well as from the other seven Czech PMs, is that a potential financial scandal is hanging over him before he takes office. The exact nature of that scandal is unimportant here. (You can read further if you’re curious.) The point, basically, is that the Czech Republic is a rather corrupt place, and its citizens know it, which results in a constant stream of new “reform” parties emerging at elections claiming to want to do something about that. 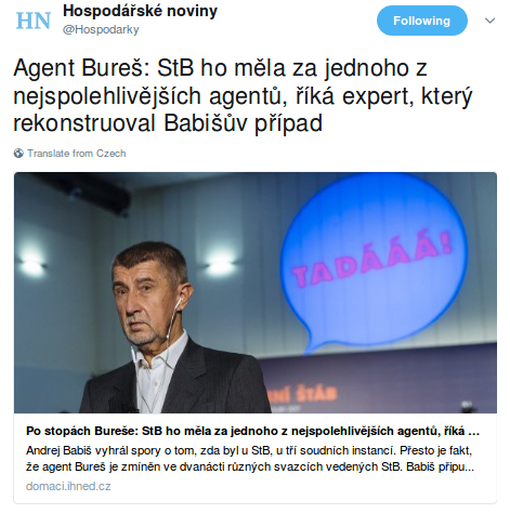 The latest is “ANO 2011” (ano in Czech means “yes”), founded and dominated by the Czech Republic’s second-richest man, Andrej Babiš, who of course is in line to become Sobotka’s Finance Minister. It’s a sad situation. But at least you can realize that this new Czech government is destined to no good end. And you read it in the Final Word – or, at least, here – first. One of the most fantastic military adventure stories in history, but which few people have ever heard of, is that of the Czechoslovak Legions. Czechs and Slovaks have generally heard about them, as you would imagine, but as an article in Lidové noviny makes clear, that fact doesn’t necessarily command any Czech government money (nor Slovak, probably) any more. Czech: Not As Bad As U Think! Let me reveal a dark secret here which I haven’t written about before (well, OK, just once) and may come as a surprise to many of you: The Czech Republic – yes, the land of Václav Havel and “living in Truth” – is, sadly, a corrupt sort of place. We were only recently reminded of that fact by the latest government scandal (the best English-language summary comes undoubtedly from the Economist’s “Eastern approaches” blog). The Environment Minister, one Pavel Drobil, was caught on tape not only manipulating expenditures from the state environmental fund to feather his own financial nest, but also covering the misdeeds up – to include offering the whistle-blower a promotion in exchange for destroying the recording. Drobil did have to resign (though the whistle-blower also lost his government job, but of course), and for a while the very existence of the current Czech coalition government (only 6 months old) hung in the balance, because the opposition tabled a motion of no-confidence in the parliament and, after all, two of the coalition parties (VV and TOP 09) were new on the political scene, propelled to prominence by citizen disgust over the country’s seeming political status quo – most especially, the corruption. In the end though, President Klaus intervened, there were a lot of meetings, everyone forgot about how anti-corruption they were supposed to be, and the current government managed to sail on. With that settled, what do we now see – and in the pages of the country’s leading business newspaper, no less! – but today’s piece by one Petr Honzejk entitled The Czech Republic is better than it seems. Masaryk’s “do not fear and do not steal” is coming back in style. There’s no use in fooling oneself. It’s enough when we can use a little realism. We live in a better country than we ourselves think. This isn’t some exercise in naïveté. Nor the obligatory pre-Christmas optimism. Only a mention that, so long as we choose anything other than a self-tormenting point-of-view, we will see a better country in all directions than a year ago. Like: Hey, we got a new government this year and escaped that “Paroubek goulash populism” we were all stuck in coming into 2010! (Jiří Paroubek actually was Prime Minister from 2005-06, but I guess he has continued to have a lot of behind-the-scenes influence.) And it’s a new government committed to enacting reforms! he adds. Stipulated – but surely his position as a writer for Hospodářské noviny enables Honzejk to be aware of the shameful compromise that has kept this government propped up, as well? It’s almost comical, the happy-talk rabbits he tries to pull out of his hat here while trying to retain an even-handed, judicious tone. “[The Czech political scene] is no utopia,” he concedes, “as the Motolska Hospital affair showed us this year.” (Wait, I never even heard about that one! But I probably don’t want to know!) But look, research shows that the amount of illegal software installed on Czech computers has declined! Hooray! No, the Czech Republic can no longer be regarded as belonging to the “Wild East,” he asserts. After all, the EU has decided to put the office of its Galileo GPS program in Prague. And the British news paper The Telegraph recently named Prague “the best vacation destination in the world,” while no less than the New York Times back in April had a laudatory (if rather short) travel article about the country’s #3 city, Ostrava (over on the eastern border). Readers of this weblog – a smallish, hard-core elite, to be sure, but we’re trying to do something about that – will have known the news already, but last Thursday President Obama came out in public to announce that his administration did not intend to proceed with the planned deployment of anti-ICBM missiles to Poland and supporting radar to the Czech Republic. Reaction to the decision was swift and vociferous, both for and against, domestically and internationally. Presseurop has a good survey of that reaction in the Eastern European press, although I feel that it tends a slight bit too much to the alarmist side. It seems many of those newspaper headline-writers have forgotten how fundamentally unpopular the American deployment was among ordinary Czechs and Poles; in this light, Obama’s cancellation of the program per se is not so regretable, but rather the considerable trouble both governments had to take to gain the political approval for their participation, now all achieved for nothing. Not to worry, though, because French president Nicolas Sarkozy praised Obama’s move as an “excellent decision,” and the editors at Le Monde make it clear that they agree (Hand extended). Yes, the proposed deployment was going to be expensive, for a weapons system about which there remained significant doubts that it ever would actually be able to do what was designed for. But don’t forget the diplomatic dividends, either, Le Monde reminds us. These mainly involve Iran, which is supposed to start multilateral talks with a range of western countries starting on October 1; Obama’s action sends them a message of “good will and realism.” And Russia? Obama’s gesture was directed there to an even greater extent, but Le Monde’s editors unfortunately do not expect to see any corresponding gesture from the Kremlin anytime soon. By the way, mention should also be made of the announcement by US Defense Secretary Robert Gates, noted in Le Monde’s news coverage of the American announcement, that the “SM-3” missiles which are now to be the replacement anti-missile system will be deployed in turn from 2015 in Poland and the Czech Republic. First of all, that is a bit over-determined: mainstream US news reports put it instead that deployment of those missiles to those countries is but a possibility. And that’s a good thing, too: recall that the original ten defensive rockets that were to be intalled in Poland were designed to counter Iranian missiles of intercontinental range. Poland presumably is a good spot to deploy those – just take a string to your globe to check out the great circle route from Iran to the USA – but that is probably not also the case for defense against the short- and medium-range missiles which are now assumed to be the only Iranian threat for many years to come. In light of this, these suggestions that Warsaw and Prague will eventually get their missiles after all have to be regarded as sheer political bull-headedness – “We won’t let anyone tell us we can’t station missiles in Eastern Europe!” – rather than anything based on considerations of military effectiveness. The Czech government of Mirek Topolánek – having lost a vote of confidence in the lower house of the Czech parliament at the end of March – is now on its way out the door. The new caretaker government headed by the former head of the Czech National Statistical Office, Jan Fischer, has submitted all the names of its ministers to Václav Klaus, the Czech president, and so is ready to take over. But what of the EU presidency, which after all the Czech Republic has had entrusted to it ever since the beginning of this year? That has largely been given up for lost, according to the Washington correspondent for the Czech Republic’s leading business newspaper, Hospodářské noviny, Daniel Anýž (Sad end to the presidency, USA summit postponed). Let me take care to note here that that “sad end” cited in Anýž’s title does not refer to now, i.e. 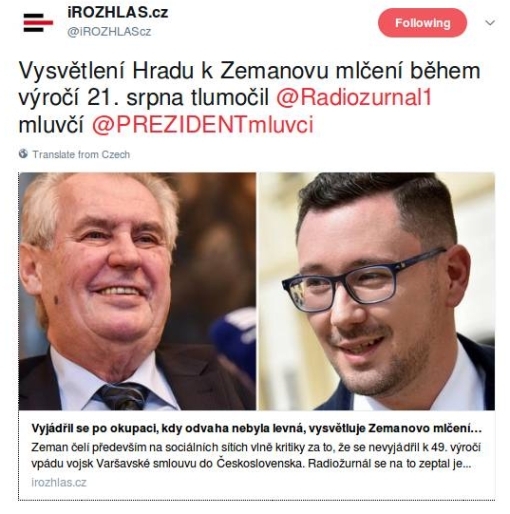 the first week of May, but rather indeed to what was supposed to be the “end” of the Czech presidency according to the calendar, namely the end of June. Anýž already knows that that is going to be sad, mainly because that was when the usual semi-annual US-EU summit was supposed to happen, this time in Washington, but the Americans have now let it be known that they want to postpone it to sometime in the fall, when the Swedes will be EU president. Now, you might well say that the Czechs already had their US-EU summit, and in Prague, which happened over the weekend of 4-5 April, following on from the London G20 summit during President Obama’s European trip. But that was officially an “informal” meeting; the US-EU get-together in Washington was really supposed to happen, as it always does, in June. But it won’t. Meanwhile, Anýž notes that the phrase “Czech EU presidency” seems to have disappeared entirely from the American media. And he quotes an analyst from the German Marshall Fund (in Washington) that the Czechs basically lost three months off of their presidency by the change-of-government, and that leaves hardly enough time for any member-state to accomplish the desired EU agenda with which it would have started its presidency. At least the Czechs did take the ratification process for the Lisbon Treaty all the way up to the point where it only needs the president’s signature; this ensures at least “sad might-have-been” status in the eyes of fellow EU citizens, whereas a failure of ratification would have marked them as something considerably worse. UPDATE: Here’s another cost of switching your government in the middle of your term as EU president: you stage summits and hardly anybody important bothers to show up. The hostilities in Georgia seem to be dying down now. Russian forces are withdrawing – or at least they are supposed to withdraw, under the terms of the cease-fire they signed, but there is considerable doubt as to whether they are actually fulfilling that obligation. In the meantime, the countries of the NATO alliance struggle to come to terms with the new ruthless military face Russia has shown in this crisis. Germany now stands central in that military alliance, in the same way it has stood central for some time now within the European Union, again because of its sheer weight of population and economic power (and, who knows, maybe also its reputation for military ability in the past), which makes German commentary on these recent developments particularly interesting. Coming: A New Cuban Missile Crisis? Coming Soon: Austerlitz Theme Park! Austerlitz: the very name is covered in glory for the French, as well as for anyone else with any knowledge of the Napoleonic Wars. For it was on this Central European battlefield in 1805 (a little less than two months after the sea Battle of Trafalgar, as it happened) that Napoleon Bonaparte faced down the combined armies of two great empires – the Austrian and the Russian – and beat them bloodily and decisively in a battle regarded as a tactical masterpiece. In the aftermath the Austrian Emperor Francis would sue for peace, acknowledging France’s previous conquests in Italy and Germany; what was left of the Russian army would be permitted to scurry back on home; and Prussia (non-participating) somehow would become annoyed enough with this result to shortly go to war against Napoleon itself (bad move). In today’s Paris you will find a Gare (i.e. train station), a Quai (i.e. embankment), a Pont (i.e. bridge), a Rue (i.e. street), a Port and a Villa d’Austerlitz – despite the name itself being about as un-French-sounding as you can get while still staying within the Roman alphabet. Has the Stanley Cup gone missing? The referendum dates for EU accession for Poland (7-9 June) and the Czech Republic (13-14 June) are drawing near, and will surely provide ample grist for the EuroSavant mill – soon, if not right now.